Vending Machine Technology: What is Right for You? You stand in front of a vending machine, credit card in hand. It's mid-afternoon and you're craving a snack before you hit rush hour on the way home. But this vending machine doesn't let you pay with credit card - it's cash only. Instead of forking over your hard-earned money, you hit the road, your stomach grumbling. Now put the shoe on the other foot - what if you weren't a customer, but instead, you owned the vending machine? What if you learned that your employees, customers, clients couldn't buy snacks from your vending machine because they weren't carrying cash? It's pretty frustrating ... this is just one reason why it's important to keep up to date. Vending machines have changed. No longer are they big cubes that may or may not give you the snack you crave when you put in the right amount of cash. Now they have features to make the buying experience more convenient for the customer. We've all been there - sliding a five-dollar bill into a vending machine, pressing A2, then watching as the bag of pretzels doesn't dispense. It just hangs there, leaving you with two options: give up, or pay twice as much. The Smart Vend feature automatically gives customers their money back if it fails to release the product after two tries, preventing this frustration. As credit and debit cards become more prolific, cash continues to be phased out. Twenty years ago everyone would carry a bit of cash in his or her wallet. Now? Not so much. A vending machine that allows credit card payments, complete with data encryption for secure transactions, is slowly becoming something consumers expect as an option. We've all been told over and over to turn lights off when you leave the room -- but what about turning your vending machine's lights off? Thanks to LED lighting and movement-activated features, modern vending machines have the capability to turn off their interior lights when not in use. If you're vending machine technology isn't up-to-date, it's only a matter of time before your employees and customers get frustrated. That's where an industry expert - your vending partner - comes in. A quality vending supplier and partner will be able to educate you on new equipment options. They can look at your individual situation and make recommendations on what type of options you should consider. As your partner, we want what's best for you, and will do everything in our power to ensure that you get it. With all of these new options, it's not as easy to see what kind of vending technology is right for you. Or even what to stock in your machines! First, ask yourself what you're passionate about, why you’re offering vending machine options, and what your consumers are looking for. If you're in love with the idea of healthy vending, find a supplier who will work with you to make sure your machines are full of healthy foods, such as dried fruits and nuts. Next, consider where you'll be placing your vending machine. Will it be in a lobby for guests and visitors, or is it one machine among a row of vending options in your company break room? Different areas call for different vending machines. Thanks to a variety of advances over the past few years, it's never been a better time to offer vending options. 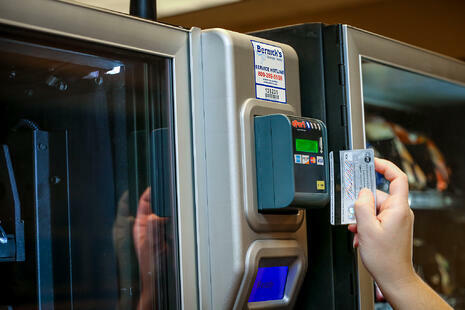 Stay up-to-date on your vending machine technology, and you can continue to foster a positive atmosphere that is enjoyed by many.